Ok, I’ll admit that this is a strange name for a recipe, but at least it gives you an idea of what you’re getting… right? Let me share a little background before launching into this recipe with you. We recently relocated to a new state, in a new town, in a furnished corporate apartment. Have you ever had to do this? It’s sort of like cooking in “your own” kitchen, but it’s not. The pots and pans are different… the utensils are unique (even though I *did* bring my own)… and even the cooking vessel (an electric stove instead of my beloved gas range) is different. Challenges to be sure, but I was determined to make our transition to this new place as smooth as possible… which meant cooking dinner each night. Yesterday, our first weekday in our new apartment, brought on my first challenge. I had to purchase *enough* food and seasonings without purchasing *too much* because, remember, this is only our temporary home. I already have the necessary pots, pans, seasonings, etc to make the meals that I want to make… but they’re currently sitting in a Jessup, MD storage unit. So, in the meantime, I’ll be doing my best to create delicious meals without purchasing too many items that will end up being duplicates if I don’t use them up before we move from our current residence. I hope you find my journey to be interesting and maybe even a little helpful! Dinner on Monday was a challenge. I went to the local Walmart to pick up some things, but this particular store was rather sparse in selection, especially since it carried no fresh produce or proteins. This is where I bought the kitty litter, toilet paper, skim milk, orange juice, spaghetti sauce, canned chicken, a loaf of bread, foil, and a large bag of individually packaged chips. While I could have stopped at the Fresh Market store a block from our apartment, I was on a particular mission to find something that would help me get groceries (and cat litter) from my car to our new home, so I was traveling around town with this goal in mind. I eventually found a collapsible cart that will be perfect for my needs and darted into the closest grocery store to stock up on some fresh items. Since this was my first venture out for supplies, I was trying to mentally flip through a number of meal options that could create the most amount of duplicate ingredients. I ended up choosing two packages of ground turkey, two packages of chicken breasts (with three in each, which could yield three meals for the two of us), some broccoli slaw, a bag of onions, romaine (for my lunch salads), a bag of onions, a small box of frozen meatballs, cooking spray, and spices (garlic salt, herbs de provence, dry mustard, italian seasonings, pepper, and Hungarian Paprika). 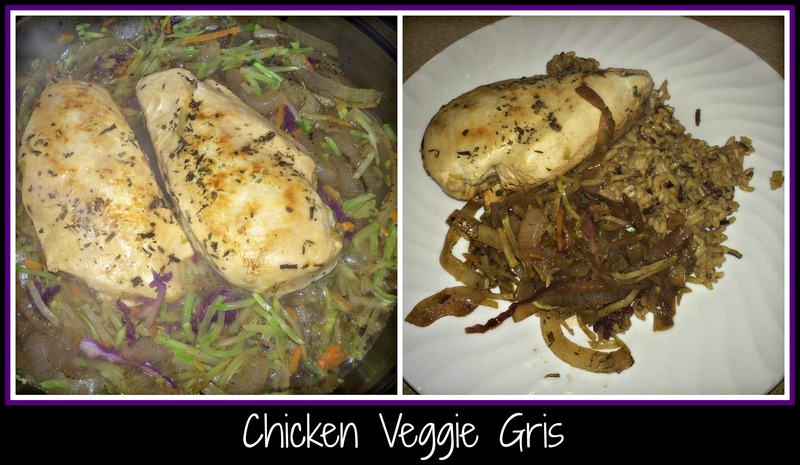 Using these basics, I decided to go with something very simple for dinner… and my Chicken Veggie Gris was born. I started by seasoning two chicken breasts with garlic salt and herbs de provence. Using the apartment’s skillet, I turned the electric burner to “8” and allowed the pan to heat. Clearly, this is not the way to do things with an electric oven because when I added some margarine and a thinly sliced onion to the pan, there was entirely too much smoke in the apartment. I quickly turned down the heat and turned *on* the vent fan to keep from setting off the fire alarm so things calmed down a little. NOTE: there was never any real danger, but it really did freak me out a bit. Once the onion had time to saute in the margarine to soften, I opened a bottle of white wine (I used a Pinot Gris, but only because I couldn’t find a bottle of James River Cellars Reserve Chardonnay fast enough) and added that to the onions to allow them to soak up some of the yummy wine flavor. I then moved the onions away from the center of the pan, placed the chicken breasts in the center to brown, and seasoned the underside of the breasts with the same seasonings as mentioned above. Dinner was looking a little bleak at this point so, after I flipped the breasts over to cook through, I added some broccoli slaw to the pan for color and veggie-goodness. Seasonings were now the priority… dinner couldn’t be bland, especially for my first attempt. I opted to add a few dashes of soy sauce, some balsamic vinegar, and about a half cup of the wine to create a sauce that would make things come together. I then cooked everything until all the flavors combined, about 10-15 minutes. The chicken was poaching nicely and, while I would have preferred to have the veggies with a little more crunch and color, the softened broccoli slaw suited my husband’s tastes and still looked pretty on the plate. To finish off the meal, I cooked a packet of brown and wild rice and used that as our starch for dinner. It wasn’t exactly the meal I’d planned, but it was tasty and home-cooked… the best way to finish out a stressful “first day”. I’ll continue to add recipes, both from before and during our move, so I hope you’ll check back to see how things are progressing. I have some recipes that I never had the chance to share, so I’ll let you know when those are posted. My attempt tonight is going to be something along the lines of a lasagna, without lasagna noodles…. will that even work? Follow me on this journey… I promise to share both the highs (yummy recipes) and lows (how in the world am I going to learn to cook without a gas stove?) of the coming weeks. 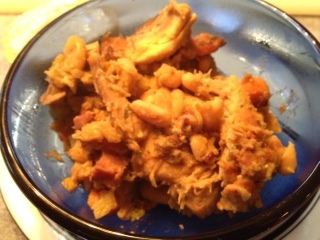 Here’s an easy recipe for Cassoulet that I’ve adapted from Weight Watchers… and included wine. This was our dinner last night and it got rave reviews from my favorite taste testers (my family). Since I use The Force when I cook (do I sound like a broken record, warning everyone about this? ), the amounts are approximate and will vary depending on the foods you prefer and what you have on hand. Start by preheating your oven to 350 degrees. You’ll start this recipe on the stove top and then allow it to cook for about 30 minutes or so in the oven, so go ahead and get this ready. If you’re doing the first part early in the day and planning to cook it in the oven just before eating, the only thing I would change would be to add an extra 15 minutes to the baking time before you serve it. Mine baked a little too long, so it’s pretty dry, but that’s the way my guys like it. In a Dutch oven (or large skillet with a lid), brown 8 boneless, skinless chicken thighs. The original recipe calls for bone-in thighs, but my family prefers to not deal with bones whenever possible. I do this in two stages and remove them to a plate as they brown. Add diced Canadian bacon and saute until browned and crispy. Add sliced baby carrots (I used about 2 cups), sliced celery stalks (I had some celery sticks that needed to be used, so I went a little overboard on this one, but I don’t believe it hurt the dish at all), and a diced onion (the recipe actually calls for leeks, but I forgot to get this at the store and I always have onion on hand), and cook until the veggies are soft and a little toasty, stirring frequently to distribute the small amount of fat left from the bacon. Add 2 cans of cannellini (white kidney) beans (drained slightly), a half bottle of James River Cellars Pinot Gris (I had this on hand… next time I’ll use James River Cellars Reserve Chardonnay), a packet of chicken broth seasoning, water (I used a coffee cup’s worth), 3 bay leaves, and some lemon thyme (from my friend’s garden). I then allowed all the flavors to combine and brought the dish to a slow simmer. Return the chicken thighs (and collected juices) to the pan and nestle the meat among the vegetables. Baking your dish: Here’s where you can take a break, if needed. I actually put the lid on the Dutch oven and let it rest on the stove top for about an hour at this point. M wasn’t due home for a bit and I knew dinner wasn’t going to need to be ready for a few hours. If you’re making this immediately, pop the Dutch oven (with lid on) into your hot oven and allow to cook for an hour. Since you’re not using bone-in chicken, you can decrease the baking time a little. Do realize that if you’re making this using bone-in chicken, you should bake it for 1 hour and 30 minutes. If you’ve taken a break and are bringing it back from “cool”, I would bake for 1 hour and 15 minutes, but this part isn’t exact. Check your dinner and decide for yourself when the meal is cooked… the meat will be falling apart and the sauce will be thickened to your liking. Remove the pan from the oven and discard the bay leaves. If you so desire, take a coffee cup’s worth of sauce (without meat) and process it in a blender until smooth, then return to the dish and stir. I totally skipped this part because my guys were “starving”, but this is a nice touch. You can also use a stick blender and just pulse it a few times near the bottom of the pan, staying away from any of the chicken. Remember to always use a wine that you would drink… there are tons out there that don’t cost a small fortune and are worthy of cooking. I always have James River Cellars wines on hand, so I tend to lean toward using those. This is one of my favorite cold-weather dishes and I hope it will become one of yours as well.